Silence is surely part of asian culture, especially in film, therefore representing a mute character means willing to highlight something deeper and different. This is what makes of Ryu a very interesting piece of this list. He looks like about to speak for the entire film, like he had an apple stuck in his throat that could jump out at any moment. There is something more though, further than his mutism: his inadequacy about this world that he face in his eccentric appearance: green hair and gaudy red shirt. Ryu (Shin Ha-kyun) live in his own silent world, amongst his dull and unrewarding job, his filthy apartment and his dying sister who urgently needs a kidney transplant, which is however too expensive for the boy’s pocket. He seems to have found a solution when He quits his job and uses his severance to pay some unsavoury organ traders: the plan would be have his own kidney removed in order to give it to her sister afterwards. He is obviously swindled and left with neither money nor kidney. But another solution comes from his eccentric girlfriend Cha Yeong-mi (Bae Doona) who suggests to kidnap the daughter of Ryu’s ex boss’s (Song Kang-ho). However, the plan goes down wrong, triggering a spiral of vengeance and desperation. Not quite a funny film to watch during a party, but a real interesting descent into moral conundrums and concepts of good and evil. Who is to blame? Ryu? The health system? The world? Then sit down, concentrate and prepare to call your principles into question. The man has no name, He is called one-eye, because He has got one eye (surprisingly). This time the character can’t speak in the conventional way, namely using vocal cords, but He can express himself through the voice of a boy, named the boy and unlike some of the previous characters One-eye is strong and fierce and apparently almighty. A true warrior in a true war called life and a true guilt to expiate. 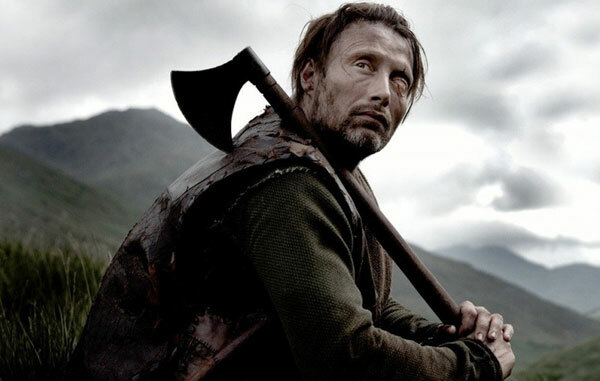 One-eye (Mads Mikkelsen) is a viking warrior of a peculiar kind, treated more like a dog than a man, left in a cage and cut loose just to fight in battles to the last drop of blood which He seems incapable to lose. When He manages to get free, One-eye kills all his tribe, apart from the boy who feeds him (Maarten Stevenson). They start wandering through the savage land and join a Christian Vikings platoon heading to Jerusalem to fight in a Crusade. The vikings journey seems to be doomed when they get lost and land on a savage and primitive territory far away from everything they know, especially Jerusalem. But while the veil of men hypocrisy falls leaving room to their thirst for power, the real journey of redemption starts for one-eye and it can’t be accomplished other way than through the only thing He has ever known: blood. A deep investigation of human need for faith, using Christianism as instance for every religion or faith or creed that led and lead men to fight each-others in ambiguous wars for something that looks often more like gold’s shining rather than god’s. What is an actor? What is an actress? Nowadays we are used to think of them as words and body, sometimes one more than other, but before the coming of sound in film, they were hundred percent body and for many of them, the sound meant the end of their career. George is one of them and availing himself of his good charming smile and his cinematic physicality He takes the audience across a silent film which talks about itself. Like a grandparent who tells his grandchildren about the glorious and shining past when people would still stand up and clap their hands at the end of something called film. George Valentin (Jean Dujardin) is a celebrity of silent films. Beloved by the public and his producer (John Goodman) and his wife and Peppy Miller (Bérénice Bejo), a rising star. But when the talkies make their appearance, George doesn’t want to cooperate and, after trying in vain to promote his own silent film, He will end up struggling against the harsh reality in the evergreen clichet of the fallen angel with the help of his loyal dog. A film about film, a past that has still something to say, something to ask. A very risky experiment that has brought an oscar to a silent movie, like it hadn’t happened since 1929. So here is the question: is the way we know the only way or is it just one way to make films? Ada could speak, but she decided not to do it anymore. Another case of mediator, in this case young Ada’s daughter, between a person and the world. Words are again the means that human beings lose first when He or She closes to the world, becoming aware of how important language has become in our society and at the same time, showing the almost forgotten other ways to communicate, like music, or body language or even silence. 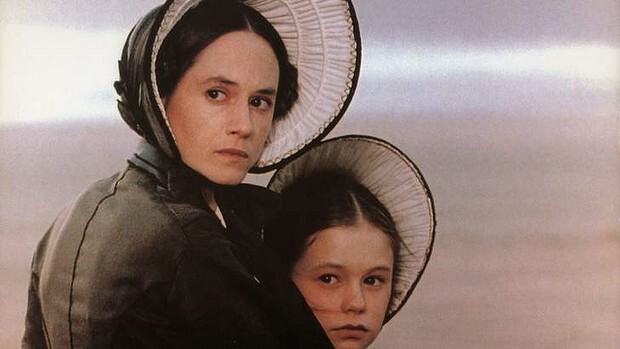 Ada (Holly Hunter) is an english mute woman, is a mother of the strong and clever little Flora (Anna Paquin), is a pianist and is promised to Alistair (Sam Neill), a man She has never seen, in a land far away from the world she knows: New Zealand. As soon as they land the premise of an unhappy future takes shape with the decision of the surly future husband to abandon Ada’s beloved piano for It is too heavy and expensive to be transported. It is the mysterious and ostracized Baines (Harvey Keitel), a friend of Alistair that gives Ada an although bitter hope when takes the piano in his house and offers her a cruel deal. A coarse, romantic story in the victorian New Zealand. Slow, dramatic and never banal this film touches a massive amount of aspects of the human experience, from the bond between a mother and his daughter through the landing in an hostile new homeland to, once again, moral doubts. althazar is a donkey who looks at our world and represents a neutral critique to it as He can neither speak nor comprehend the human behave. Resilient and silent, like a donkey is expected to be, Balthazar goes through drama and tragedy with his head low and marches by inertia towards his next challenge. How can an animal shows its will? How can humans know that what they want is what is right for it too? The communication at both its lowest and its highest level, where a creature that we can’t understand tells us about our own world. 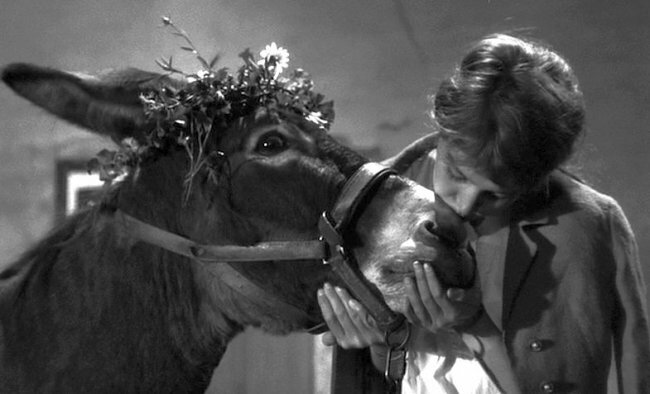 Balthazar is the name Marie (Anne Wiazemsky) gives to a donkey she spends days with through the inevitable tragedies that life has in store for her. In time their paths will separate although we will see them living their parallel lives. Balthazar will be sold from an owner to another, from gentle to cruel, from the anonymous lair of an alcoholic to the limelight of a circus, but always accepting his fate in the hands this for him incomprehensible mankind. Considered by many one of the maximum expressions of cinema of all time, this film by Robert Bresson is not entertaining in the usual sense of the word, but highly entertaining soul-wise speaking. A real march through the holes of tragedy, where the donkey turns into a metaphor for inertia, inscrutability of human fate and the constant feeling of being prey of the circumstances. Author Bio: Kosmo wanted to become a pirate, but he suffers from sea sickness so he decided to become a land pirate, namely a screenwriter. Check out his adventures on vimeo or facebook.